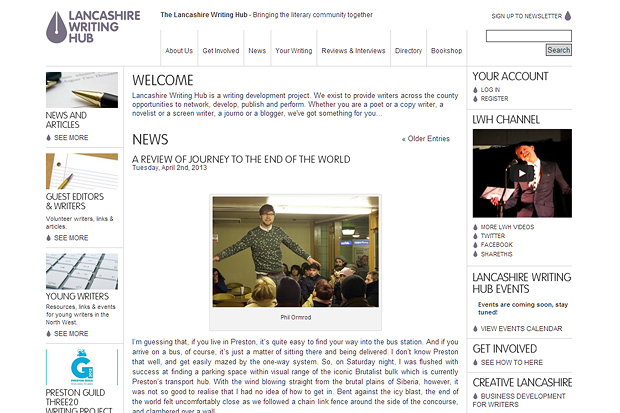 The Lancashire Writing Hub was a resource and development project for North West writers. It offered information, opportunities and resources, both through our dynamic website and social media outlets and in face-to-face development opportunities. The website itself offered CPD opportunities for writers, with volunteer placements for copywriters and guest editors keen to improve their writing CVs and literary profiles. We also ran in-house formal volunteer placements for those wishing to build their skills in the literature sector. We regularly ran writing workshops, live literature, and other events across Lancashire to writers at all levels of engagement, from beginners to professionals, both in creative writing and reading opportunities and in professional skills development, such as synopsis writing skills and social media networking skills. We offered publishing opportunities both online and in print, through creative writing competitions and copywriting opportunities. We are currently developing a second phase of the Writing Hub, with new strands to our resources, including boosted resources for young writers and opportunities for screenwriters and playwrights. Watch this space for news – coming soon. Read about Word Soup, a live literature event programmed by LWH for The Continental. Partners: Lancashire County Library & Information Service, West Lancashire Borough Council, Lancashire Evening Post, Preston FM, Creative Lancashire, The Continental.